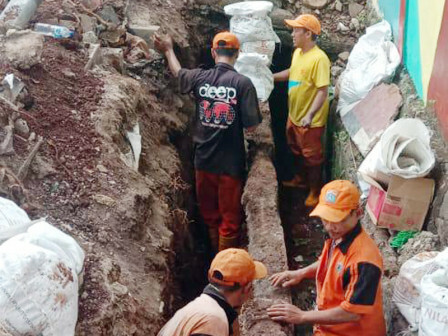 Five Pondok Labu PPSU personnel repair channel's retaining wall on Jl. Swakarya Bawah RT 01/01, Pondok Labu, Cilandak, South Jakarta.
" We repair this retaining wall because foundation under channel starts to erode and prone to landslide"
"We repair this retaining wall because foundation under channel starts to erode and prone to landslide," said Siti Fauziah, Pondok Labu Urban Village Head, Wednesday (11/7). She explained, total length of the channel is 5.5 meters and width 50 centimeters. Currently personnel clean up areas around the retaining wall thus new foundation from cement and river stone can be installed. "Hopefully this repair can make retaining wall can functioned optimally," she co nveyed.